‘Wide Eyed’ review, an exhibition by Bridie Gillman at Edwina Corlette Gallery. 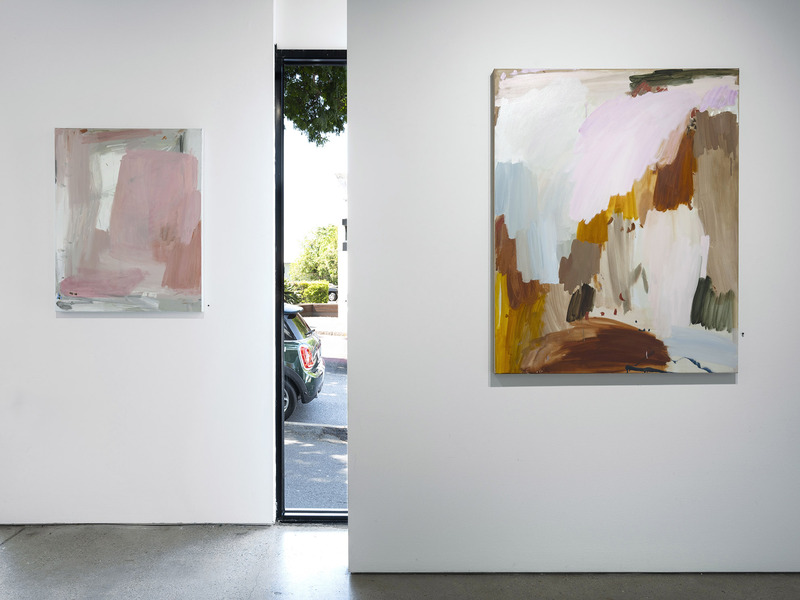 Paint jumps across the canvas, dancing between the light, in artworks by Bridie Gillman. As a Sydney-sider, I went up to Brisbane to visit her recent exhibition at Edwina Corlette Gallery, titled ‘Wide Eyed’. The sentiment of wide-eyed can be attributed to Gillman’s own experience in the nature that inspires her work. I learnt from Gillman that while based at the Tarragindi Recreation Reserve for an artist residency, she was able to reflect on her environment and her narrative of love and fear for the Australian landscape. Set within the long, looming gumtrees, and low-lying scrub is a fear for the artist, a fear of the unknown, and the real fears of snakes. A concern the artist attributed to her mother, one she is trying to shake off in her explorations into the bush. Within the mystical sense of nature, and the power it can hold over the viewer, there is a need to be accepted by your environment. For Gillman, flora and fauna can seem daunting and awe-inspiring, as we see this determination to understand the unknown in her paintings. Being wide-eyed in your surroundings extends beyond the physicality of the space, being in nature is about listening, seeing, smelling. Gillman’s titles of the works act as poetry to conceptualise the imagery. For The Clouds Are Disappearing, Evaporating Into The Sky (2018), blue gestures of paint fill the canvas, layered with various shades that mirror the sky. The texture is formally built through Gillman's application of the oils, and the painting seems to glow with the soft muted background tones that lift the colours of the sky. A story and narrative grow, as the application of paint changes direction. The greens of local trees finish the top left corner of the canvas in an all-over methodology that the artist uses to emulate the vastness of space. The dominating oil on canvas is large, 100 x 125 cm, yet nods to a minor viewpoint of the artist’ perspective set in the Australian bushland. 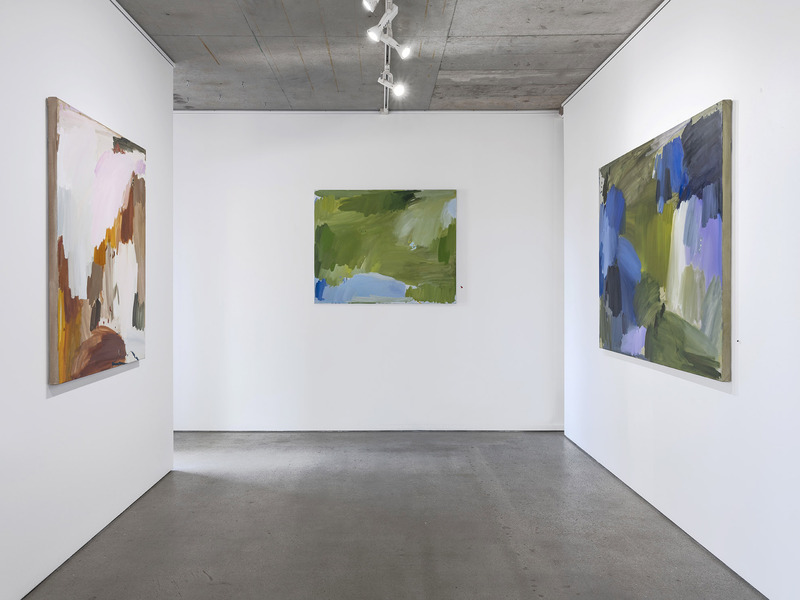 Gillman uses an ample amount of colour in her artworks, and throughout the entire exhibition, we see her visions of her landscape at her studio. The eye can not settle on one colour scheme as we move between blues, greens, yellows, oranges, to pinks, reds, and browns. Colour is muted, but contrasted, with bright reflections of light that pull the tonality and skill of Gillman’s painting style. Flowering, Fiery (2019) is a perfect example of colour that plays with each other’s aspects in their framing. Again, a large oil on canvas, at 100 x 125 cm, this artwork rejects a peaceful natural setting or muted colours with its dominating gesture of reds and orange that creates movement in large forms. The paintbrush doesn’t seem to hover above, instead, piercing the canvas; reflecting the duality of what is considered a natural setting. Soft pinks bloom from the bottom of the composition and frame the fiery red paint. 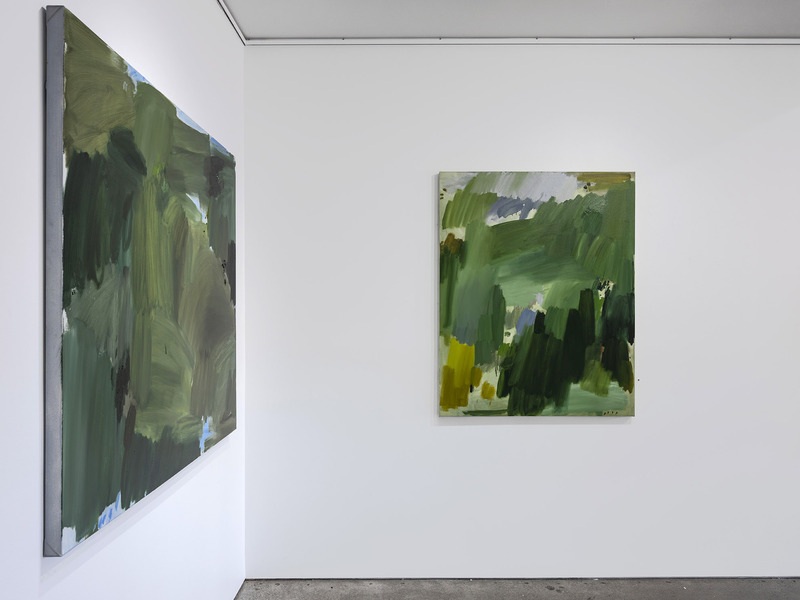 Australia's landscape is immortalised in Gillman's paintings, with its range of flora that discards and contrasts uniformity. Soft pinks continue in Fallen and Soaked (both 2019), to Blush (2018) and A Warm Breeze (2019). The title of the works creates a reflection on the artist’ emotions. What she feels is mirrored in the texture of each oil on canvas as we consider the fallen branches or soaked skin, clothes, and foliage from a passing shower. The medium of the paintings being an ode to patience itself; the oil resisting layers until they are set. The brush strokes are clear and evident in the painterly hand, giving the painting the personality of the artist. As Van Gogh ran around in nature trying to capture light, shade, and movement; Gillman is still, like a lake mirroring its surroundings in awe, but with depth. Looking Up (2018) fluctuates perspective from looking out to distant objects, to the immediate trees covering the sky. Light dazzles of Maya and baby blues, juxtaposing the harsh and heavy draping of greens that make up the looming canopy. Gillman’s brushwork flashes between and on top of each other; building layers that reflect the nature from the artists’ studio. The density of paint builds intimacy with the canvas as it closes upon you, but also a claustrophobic impression. The audience can dive into the painting to explore their feelings and thoughts of exploring unknown territories. I believe here is the junction for the artist’s context for the paintings on show at Edwina Corlette Gallery. Gillman offers her perspective and fears but also opens them for the audience to become witness to the beauty of the sublime. Nature can feel overwhelming in its infinite state, but Gillman conceptualised her emotions within her brushwork, colours, and scale. Pretty pinks of flowers contrast muddy greens of shrubs, and olive greens from trees set the stage for dazzling blues for the sky and clouds. ‘Wide Eyed’ is a love letter to the artist’s environment, but it’s honest and revealing in what it keeps hidden. 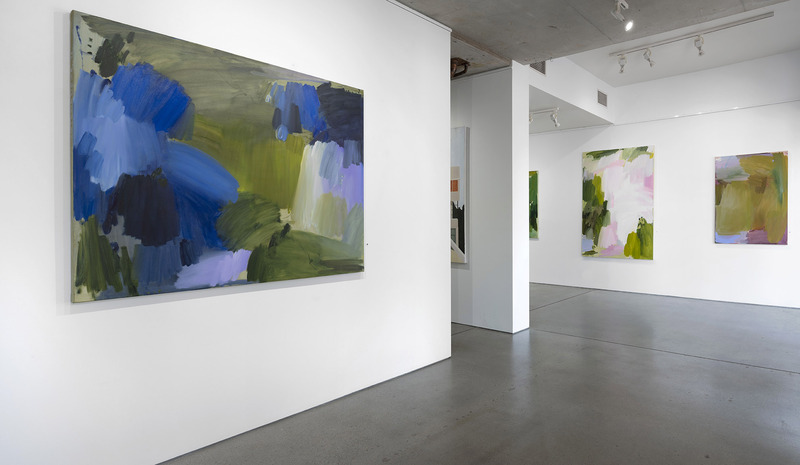 Install shots Courtesy of Edwina Corlette Gallery.